than LOGIX Insulated Concrete Forms. Energy efficiency you can actually see. 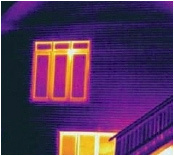 These photos were taken of two neighboring homes at the same time, using a thermal camera that shows heat loss as a bright glow. 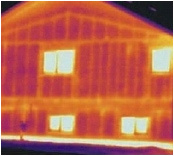 The home on the left was built with conventional walls, and shows a large amount of heat loss across the entire surface. The home on the right was built with Insulated Concrete Form walls and shows minimal heat loss. LOGIX ICF systems sandwich the insulation of thick foam with the strength of concrete for walls that are superior to traditional methods of construction. You'll see lower heating and cooling bills, and that's just the beginning. Comfortable LOGIX ICF walls naturally keep rooms cooler in the summer and warmer in the winter thanks to a higher effective R-Value rating, low air infiltration and high thermal mass. Stronger Engineered to withstand 200-mph hurricane winds, LOGIX ICF walls also come with up to a 4-hour fire resistance rating. Quieter With an STC rating of 50, LOGIX ICF walls cut sound transmission by more than 50% compared to conventional homes. Healthier Airtight LOGIX ICF walls help prevent the growth of mold and mildew, and make it easier to control and monitor airflow. Friendly LOGIX foam panels are made from up to 10% recycled EPS, and LOGIX webs are 100% recycled polypropylene. While the up-front cost of a LOGIX home may be slightly higher than a traditional home, the energy savings can really pay you back. This chart illustrates the difference between "Price" and "Cost" using general comparative estimates. The home built with LOGIX will save you approximately $200 in monthly energy costs, allowing you to pay off your mortgage sooner. Biltmore will give you credit for any unused LOGIX blocks on your project. It's one of the ways we'll make sure you're 100% satisfied with our products and service.